My new book is ready. 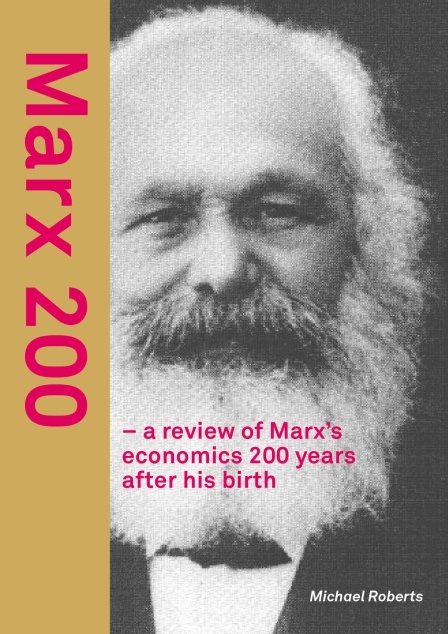 Called Marx 200 – a review of Marx’s economics 200 years after his birth, it is published by Lulu and is now available on Lulu’s site. With the 200th anniversary of Karl Marx’s birthday on 5 May, I thought it might be useful to attempt to explain Marx’s economic ideas and their relevance to modern economies 200 years after his birth. So in this short book, I argue that Marx developed three key laws of motion of capitalism, around which a clear analysis of the nature of modern economies can be understood. From these laws, we can understand why capitalism cannot escape being subject to regular and recurring slumps; causes vicious rivalry among national states that leads to perpetual wars; and engenders uncontrolled and wasteful use of natural resources that now threatens the destruction of the planet itself. Marx’s laws also tell us that capitalism is not here for eternity but has a finite existence. The question before us, 200 years after Marx’s birth, is what would replace it as a mode of production and social organisation for human beings on this planet? The development of Marx’s economic thought can be divided into four parts: his childhood; as a young man; as a mature man; and the old Marx. In his teenage years, he was under the influence of his father and his father’s friend, Count Von Westphalen. They were both men of the enlightenment, followers of the ideals of the French philosophers and revolution. Marx was born just after the end of the so-called Napoleonic wars and at the start of a gradual economic recovery in the petty German statelets. When Marx went to university in the late 1830s, he was a radical democrat in opinion, one of the ‘Young Hegelians’, who were philosophically opposed to religious superstition and autocracy. The period of Marx as a young man from the point of him leaving university and without an academic post was one of radical upsurge in ideas and political action in Europe. Britain was in the midst of the ‘industrial revolution’ with all its expansion of machinery and goods and the accompanying dark exploitation of labour. The Reform Act of 1832 had given the middle classes the vote but now there was pressure from the Chartist working class movement for full franchise. In Germany, workers in the towns were organising for the first time and peasants in country were growing restive. Economically, in 1840 there was the establishment of the German Customs Union, the Zollverein, which brought an end to trade barriers within the Prussian sphere of influence and began a huge economic upsurge. On leaving university, Marx became a radical journalist with a growing materialist conception of class struggle. Marx started to take an interest in economic developments under the encouragement of his new and eventually lifetime friend, Friedrich Engels. Engels lived in the heart of Capital, Britain’s industrial Manchester, and was already writing on the economic and social consequences of capitalist development. Marx and Engels became communists, an ideology designed to replace capitalism as a mode of production and social organisation with communal control, with the working class as the ‘gravediggers’ of capitalism to deliver this. They wrote the Communist Manifesto in 1848 (Marx was 29 years old), just before the outbreak of the revolutions against autocracy across Europe. The manifesto intuitively recognised the nature of capitalism, but without expounding any economic laws of motion. The defeat of the 1848 revolutions and Marx’s eventual exile to Britain began the period of mature Marx (aged 32 in 1850) that lasted until the defeat of the Paris Commune in 1871 (aged 53). This turned out to be the period of the long boom in the European economies. Britain was the dominant economic and political power and thus the best placed to study the economics of capitalism. The boom revealed to Marx and Engels that there was no short-cut to revolution and capitalism still had some way to go in its spread across the globe. The first international slump in 1857 did not lead to the collapse of capitalism or to revolution. Marx concentrated on organising the first international party of the working class (the International Working Men’s Association) and on writing his main economic work, Capital. The defeat of the Paris Commune in 1871, followed by the financial panic and crash of 1873 in the US, which spread to Europe, set the final phase of Marx’s life. It was also the start of what was eventually called the (first) Great Depression, where the major capitalist economies struggled to recover from crashes and became subject to a series of slumps. This was a vindication of Marx’s laws of motion. Marx died in 1883, in the depth of the latest slump in Britain. Marx remained an obscure figure in economic and political thought after his death, except in the circles of the leaders of the burgeoning social democratic parties of Europe after the Great Depression came to an end. In this new period of economic recovery of the 1890s, unskilled workers formed trade unions and working class organisations built mass political parties with increasing voting power. Marx’s ideas now became more widespread. The victory of the ‘Bolshevik’ (majority) social democrats in the Russian revolution in 1917 then placed the works of Marx and Engels on the world stage through the 20th century. The book will look back at Marx’s economic ideas and see just how relevant they are for 21st century. This entry was posted on March 27, 2018 at 7:05 am and is filed under capitalism, economics, marxism. You can follow any responses to this entry through the RSS 2.0 feed. You can leave a response, or trackback from your own site. Congratulations on the new book Michael! At the risk of being pedantic/irritating, I am repasting a question I made as a comment on your prior post, in case you missed it, as I would appreciate your reaction (gut or otherwise). If it is a stupid question, I don’t mind you saying so! “Hi Michael (and other readers), this is rather tangential to your current post, but I wanted to ask your opinion on a rather abstract line of idle (amateur) thinking when pondering the UBI. The basic question is: has anyone considered a form of UB that doesnt rely on redistributing surplus appropriated by the state, but rather a UBI premised on the final value of consumer goods produced? In other words, if a $1 billion of goods and services were produced, the population would receive an equal share of $1 billion in their bank accounts. Higher productivity would only result in higher ‘baseline’ consumption for population, including for those made redundant. Those whose labour is still required, would still be incentivised by the prospect of higher consumption through their wages for their labour-power. All the better if the workplace is democratized (i.e workers become the owners of their enterprises). Look forward to reading it and congratulations on helping to keep the ideas of Marx relevant. We must ensure that in the end, the 21st Century belongs to the working class, otherwise society can be flung backwards. Is it true that Marx thought he was writing for the working man? Cause I have been staring at Capital V1 for two years now. I find it hard going. Really hard. I might give up trying to read the original. I have learned more from people, like Mr Roberts and Kapitalism101, talking about Marx. So I look forward to this book. Michael — what do you think of Ben Fine’s MARX’S CAPITAL? Sid. I agree with Michael. Personally, I read Harvey’s A Companion to Marx’s Capital before reading Capital Vol. 1. It was the companion that encouraged me to read a thick and very rich volume. Hi, Michael. Just got across this. Marx the conservative? Marx and Engels were far from neutral observers in the campaign to push women back into the home. Marx frequently quotes the Tory factory reports verbatim, as if their moral outrage at the presence of women workers required no further comment. In his report on The Condition of the Working Class in England Engels went much further and complained that factory labor was reversing the proper order of relations between the sexes. It “unsexes the man and takes from the woman all womanliness”; turns the family “upside down.”1 It’s interesting to read between the lines of Marx’s account of this process, to see just how the sexual division of labor was created and how the nineteenth century family came to be created. Women’s labor had first to be politicized as problematically unreproductive – a threat to the family unit – before it was disciplined into the work of reproduction. People like Janet Halley and her colleagues have done a lot of very interesting work to show that we can’t understand the rise of the commercial contract – the model of the free labor contract – without simultaneously paying attention to the legal constitution of the family, as a space of non-contractual obligations and unpaid personal services. Modern family law and labor law were co-constitutive, and yet Marx’s critique of capitalism has everything to say about freedom of contract and nothing to say about family law and the way it shaped our understanding of the production/reproduction divide. Much of his work assumes that the division between production and reproduction, work and the family was already in place at a time when there were massive battles being fought to confine women to the space of so-called “reproduction.” This already tells you that we shouldn’t be looking to Marxist-feminist concepts such as “social reproduction” as if they were a given. Dear Michael, Have you had a look at Marxian Political Economy published by Tulika Publications, New Delhi in 2013?. I am the author and the book is meant to be a simple yet rigorous introduction to the first volume of Capital. It was aimed at students and Left activists involved in mass and class struggles. Would like to know what you think of it. No I have not read it – will do so! Is this the book to be released on the 11 April by Amazon in paperback containing a number of essays. ow at lulu.com. Amazon will have it some time in April though. Some knowledge may be involved but I think you’ll find easier to read than some of my posts! It is aimed at people like you, Nicholas. You can tell me if it works. This enquiry would have been better attached to one of your recent interesting posts on the looming trade wars, sorry, but I wonder if I could ask do you have an opinion on the views of Peter Nolan of Cambridge University. I have always found his work a useful antidote to the “Death by China” chorus. Do you think the general thrust of Nolan’s arguments are still valid? Ill read his stuff. But his general argument that China is still not the leader in global companies and finance is broadly true, I think. But over the next generation…? Is there an ebook version of Marx 200? Is the kindle version copy protected (DRM) or can it be used on any PC that can read and convert kindle format without a registered kindle device ID and book ID?